What are these reading/writing heads of a hard disk? I just want recover data from hard drive, so why should I change them? Let us first understand how a hard disk works so that it will be easy for you to figure it out. Every hard disk has 3 moving parts like a gramophone. This is the simplest explanation to how a hard disk functions. Like the gramophone, the hard drive also has disks known as platters, which is where the reading and writing of data is done. The reading/writing heads are in the hard drive and are situated at the tip of the actuator assembly. They are the components that read and write the data on the platters. If the playing needle of your gramophone gets damaged, it will play properly only if you change it. 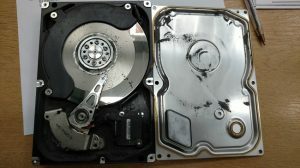 This is exactly what a hard drive recovery service like Data doctor will perform during a disk recovery process where the read/write heads are the major cause of the drive failure. These read/write heads are positioned slightly above the platters when they rotate at speeds as high as 5400 RPM to 12000 RPM, based on the type and speed of the hard disk. How Do the Read/Write Heads Get Damaged? A hard disk usually houses several platters stacked on top of one another. Data is primarily written to the upper and lower surfaces of the platters, hence, there will be read/write heads on the top and bottom of every platter. Therefore, if your hard drive has four platters, it must have eight read/write heads. If the read/write head of your hard drive is damaged, it will not be able to perform its function of reading or writing data to your hard drive. In such cases, the drive may not be fully damaged yet. You might be able to recover deleted files through a hard drive recovery procedure, or it might not start up at all. A failure of the read/write head does not mean that your entire disk has failed. Sometimes, just one or more components fail but the disk might function properly. Nevertheless, a read/write head damage may damage the platter too, leading to dust formation that might damage the other heads also. If your hard disk is not being recognized by your computer or laptop, do not turn it on. Those clicks might indicate a failure of the read/write head. The hard drive data recovery completely depends upon which head has been damaged and if a head swap is required. If the damaged head is the one that reads the service data, there is no chance for the drive to start up. However, data recovery services have hard disk recovery experts who might be able to perform a hard disk repair by focusing on the good heads and removing the damaged ones. This will lead to an undeveloped disk image and a fractional hard drive recovery. How Is the Read/Write Head Stack Assembly Changed? The process of replacing a read/write head is very exhausting and cannot be performed without a high-level of expertise, experience, and the required equipment. An appropriate donor head set is also required. Okay now think about a sick man with a damaged kidney that requires a transplant. The donor must match all the criteria with the recipient patient. Similarly, the donor drive must be exactly same as the recipient depending on the manufacturer. After a matching donor is recognized, a dust-free clean environment must be arranged to perform the transplant. The clean room set for the hard drive repair must have an industry grade of ISO 5 CLASS 100. Then, the heads are removed from the donor drive and transplanted onto the recipient. Even a minor mistake during this process can completely damage the new donor read/write heads and may scratch the existing platters too.